TransportAPI.com has been working with Ford to enable drivers to better analyse their driving. Together, we monitored Ford’s new connected car fleet for 80,000 hours and extracted 300GB of complex sensor data from the vehicles. By monitoring variables such as braking speed, gear shifts, windscreen wiper usage and engine speed (as well as weather and road speed) we built up an extremely granular picture of driver, vehicle and fleet behaviour. The project produced some fascinating results. Take one driver as an example – in this journey from Southampton to Chelmsford, we can see a cluster of high-speed, heavy braking events on the A12 around Ingatestone. Having access to this data allows the individual to build up a picture of why and where these events happened and benchmark their driving style against others’. 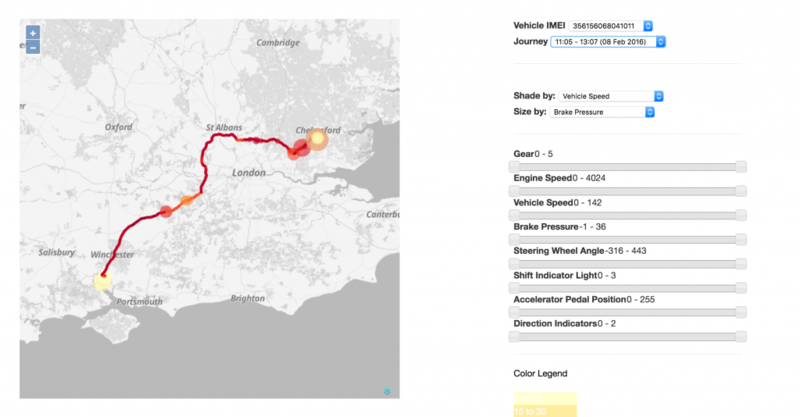 By cross-referencing vehicle data with the fleet as a whole we can start to analyse driver behaviour across different classes of roads and overlay this with data such as weather patterns. This kind of data is of interest to traffic planners to predict future accidents and local authorities for thinking about the wear and tear of roads. The Ford connected car fleet can also sense air pressure and precipitation levels – this could be of interest to meteorological organisations for calibrating and improving local weather forecasts. Making the vast array of collected transport data ready to use to lead to insights is our core aim at TransportAPI.com . We’ll explore some of the other findings from this project in an upcoming blog.